CAIRO, May 29 2014 (IPS) - With a result already known before the race started, many did not even bother heading to the polling stations and the streets in Cairo were unusually empty during the election process that ended Wednesday, just like the ballot boxes. Egyptians had been called on to vote for their second president in two years, but the low turnout threatened to undermine the credibility of the popular candidate. former army chief Abdel Fattah el-Sisi, who wanted to show the world once and for all that the overthrow of the first freely-elected president, Muslim Brotherhood’s Mohamed Morsi, was not a coup by the military but a revolution backed by the Egyptian people. Sisi himself had aimed for an 80 percent turnout but, after two days, this turnout seemed unachievable. 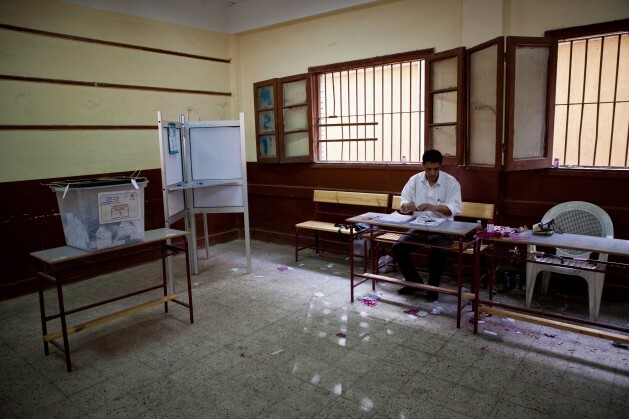 Observers estimated that 20 percent of the electorate had cast votes over two days, while organisers of the campaign of Hamdeen Sabbahi, Sisi’s only opponent, said they had logged a turnout of no more than 15 percent turnout. In a first attempt to boost these numbers, Egyptian authorities extended the voting on Tuesday by an extra hour. And shortly after that, another effort was made by granting an extension of an extra day on Wednesday. The Presidential Election Commission defended this decision stating that it was a response to calls by citizens who were struck by the heat wave in Egypt and therefore could not go to vote. But this latter attempt was seen by many as a fraud. “This was ridiculous,” said Omar Amin, a 28-year-old architect. “We all knew it is not about who would win these elections, but how many votes there would be. It made no sense to extend the voting by another day, just to reach the numbers they had in mind.” Amin is one of many young people who decided to stay at home instead of casting a ballot. But the concerns about turnout were already clear long before the heat wave arrived on Tuesday. After the authorities declared the second day of voting a national holiday and several other measures were taken to improve the turnout, the worry was crystal clear. Major shopping centres had to close their doors hours before normal closing time to make sure Egyptians would not use their newly announced holiday for shopping instead of doing their duty as citizens. But not everybody was convinced by the propaganda of local media loyal to both the interim government and frontrunner Sisi. “I am not voting. Even if I were in Alexandria where I should be voting, I wouldn’t make the effort. I’d rather shoot myself,” Marc Dimitri joked during the elections, referring to the controversial quote of the TV anchor. Young Egyptians seemed to stay far away from the polls. The women lining up at the “females only” polling station in the Garden City district of Cairo were all in their early forties or older. They believed their vote would make a difference. “Sisi will win the elections! Our hero, I love him,” chemistry professor Malak Mehdi shouted. “He understands the Egyptian people, he knows our needs. Sabbahi is nobody, Sisi will assure the stability of Egypt,” she added. Sisi’s propaganda machine seemed to have worked. The adulation of Sisi over recent months pushed many to vote for him, mostly women who adore him and see him as the saviour of the nation. But a couple of blocks away, at a local coffee shop, some friends gathered for tea instead of casting votes. Like Dimitri and Seif, they questioned the capability of Sisi to rule their country. “His (Sisi’s) campaign was totally focussed on the war on terror, he didn’t talk about the future. But what is next? What will he do after all Islamists are jailed or killed?” wondered 31-year-old Nader Abdelrahmen. “A year ago we were told that someone would be held accountable for the hundreds of deaths during the dispersal (of a pro-Morsi sit in at Rabaa in August 2013, ed.). Today we see all Muslim Brotherhood leaders and its members arrested or even sentenced to death – nobody talks about the massacres anymore. And we are the next to come: they have already started threatening us. Is this justice? Is this how he will rule over Egypt?” complains Ammar Abubakr, a prominent 33-year-old graffiti artist and activist. “I am not boycotting because I agree with the Muslim Brotherhood. I am boycotting because I am against the failure of this system. At this point, there is no suitable option for this generation,” he continued. Although the Brotherhood called for a boycott of these elections, and most of its supporters stayed away from the ballot boxes, there are apparently many other reasons why the turnout was beneath all expectations – and the extension of the voting did not substantially affect the final results. Number one in this race for president is he who stayed at home. Sisi ended up right behind, with 90% of the votes out of the roughly 40 percent turnout, which makes him the new leader of Egypt – despite the heat.